Are you holding an outdoor event soon? If you are using a marquee, cooling can be a requirement any time of year. With our marquee cooling hire you can spot cool specific areas of your marquee, tent or indoor event space. You may wish to keep the dance floor area cool, the bar area, food preparation or event kitchen cooler, or comfort cool the entire marquee. Whatever time of year you are holding your event - winter or summer - we are here to advise and assist you on the best marquee cooling or heating hire package for your event. Our portable event cooling and air conditioner units include fans, evaporative coolers and portable air conditioner units, including mobile, energy efficient spot coolers where the warm air is ducted outside the marquee. Some spot coolers also feature a heat pump making them extra versatile as they can warm or cool a marquee. 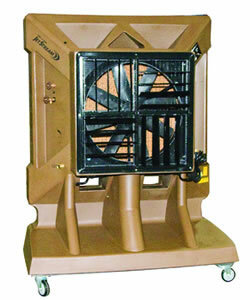 Midland Cool also have a wide range of patio heaters for hire for use in outdoor events and parties. An effective cooling solution with a powerful motor and fan, suitable for use in larger areas and ideal for commercial environments. Low noise, also suitable for office or warehouse and server rooms. The Honeywell FR60EC is the perfect choice to keep large indoor and outdoor environments comfortably cool and breezy and is one of the newest evaporative cooler models that London Cool have to offer. The Honeywell FR48EC is a stylish high quality evaporative air cooler that is ideal for both indoor and outdoor cooling. An air conditioner is an appliance, system, or mechanism that is designed to extract heat from an area using a refrigeration cycle. A complete system of heating, ventilation, and air conditioning is referred to as HVAC. Its purpose is to provide comfort conditions during hot days and nights. Air-conditioning units pump out thermostatically controlled cool air that has been chilled through heat extraction. Temporary - in areas where air conditioning might not normally be needed, but there is a temporary requirement. Portable Air Conditioning units which have flexible cold air outlet tubes are normally called 'spot coolers' and consist of a compressor, condenser coil and evaporator coil in a single, self-contained unit. They are designed to cool specific areas, the positions of which are determined by the direction of the outlet tubes or nozzles. Inside the unit, cold refrigerant passes through the copper pipe from the compressor coil into the evaporator coil. A fan blows over the evaporator coil, venting the cool air out. A second fan pushes hot exhaust air out through flexible ducting. As well as cooling the air, the moisture is re-condensed out of the air and collected in an integrated water reservoir that is emptied manually. A split system has an indoor unit on wheels connected to an outdoor unit via flexible pipes, similar to a permanently fixed installed unit. Split system room Air Conditioners come as either refrigerant based or water cooled.